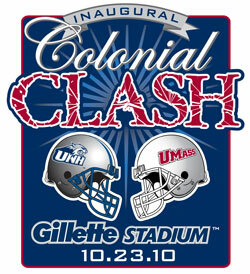 The first college football game at Gillette Stadium has been dubbed, fittingly, the "Colonial Clash." UMass and New Hampshire, fierce rivals on the gridiron dating back to their Yankee Conference days, through the Atlantic-10 years, and now the Colonial Athletic Association, will renew their storied series on Saturday, Oct. 23 in Foxboro (3:30 p.m.), the first matchup of a two-year agreement. “It’s a fitting name for a border rivalry between schools who represent two of the original colonies,” said Patriots owner Robert Kraft. UNH and UMass have played each other every year since 1952, with UMass holding a 43-26-3 advantage. UNH captured the 2008 game 52-21 while UMass won a thriller last season 23-17. The annual rivalry almost always has a direct bearing on the Colonial Athletic Association championship chase: UMass and UNH have captured or shared the conference’s North Division title each of the last six years. UMass has advanced to the NCAA championship three times since 2003 (2003, 2006 and 2007) while UNH has been selected to play in the NCAA championship each of the past six seasons (2004-2009). Tickets for the “Colonial Clash” are on sale now through Ticketmaster and the Gillette Stadium Ticket Office. Alumni of both schools can purchase tickets through their respective institution’s ticket offices. The $25 ticket includes parking. Fans can select seats on their respective school’s sideline. Tailgating will be permitted prior to the game with parking lots opening at 11:30 a.m. Group sale discounts and incentives for parties of 20 or more are available through Gillette Stadium directly by calling 877-438-7387.